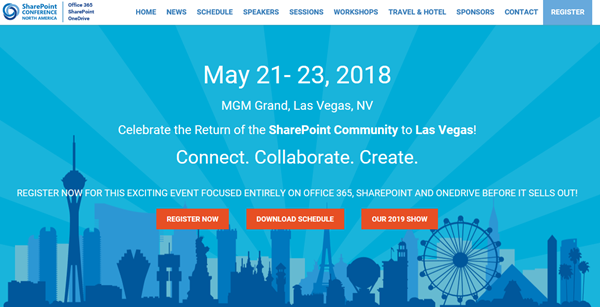 This week, from May 21st to 23rd, SharePoint Conference North America 2018 took place in fabulous Las Vegas, in the MGM Grand Hotel. Martina and I were glad to be part of the conference and enjoyed the conference, the networking and cool announcements and sessions! See some visual impressions of #SPC18 here! Martina and I had a workshop about “Office 365 governance” on the pre-conference days on Saturday, May 19th, and Martina delivered the session “The Keys to Office 365 Groups Management” together with Microsoft’s Christophe Fiessinger on Tuesday. See the full conference details at sharepointna.com. 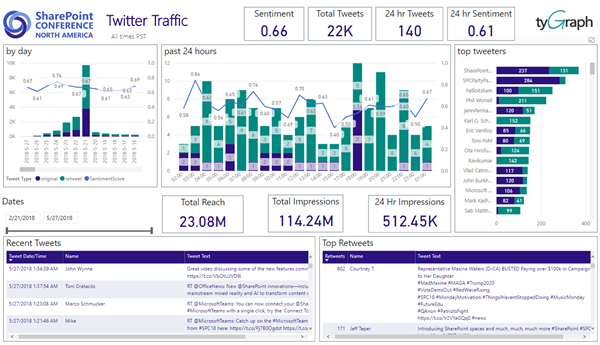 As usual, see some conference feedback and interesting data at TyGraph’s SPC18 Twitter statistics – Thx guys! Since we’re on the go to European Collaboration Summit 2018 (see #collabsummit), we just wanted to share some quick visual impressions of #SPC18. Enjoy! We had a great time at sharepointna.com. Hope to CU at the next SPC!